MedActionPlan – Educate. Empower. Adhere. Educate patients and facilitate patient centered medication management. Empower clinicians and patients to actively engage in and improve patient safety and adherence. MedActionPlan is one of the best tools for teaching and communicating medication regimens with patients. The program makes it easy for patients to understand and follow the times, how many to take and why they take their medications. This program really makes a difference, especially with our low literacy patients. What I hear resounding from our staff is that what you have developed in MedActionPlan is the most consumer-friendly tool our staff has ever seen. Our staff sees the value for the patient, and what we hear consistently from our patients is that they love MedActionPlan. They just love it! It is obvious your company understands the whole patient thing, because you guys just nail patient-friendly. MedActionPlan Pro has been instrumental in reducing home medication errors in Hematology/Oncology patients requiring a steroid taper. Additionally, it has increased patient and family understanding in complex chemotherapeutic regimens requiring alternate dosing. MedActionPlan PRO is so simple to use, and our patients find the medication schedules easy to understand and follow. This is essential to our business model which is to reduce readmissions for our customers who are hospitals. 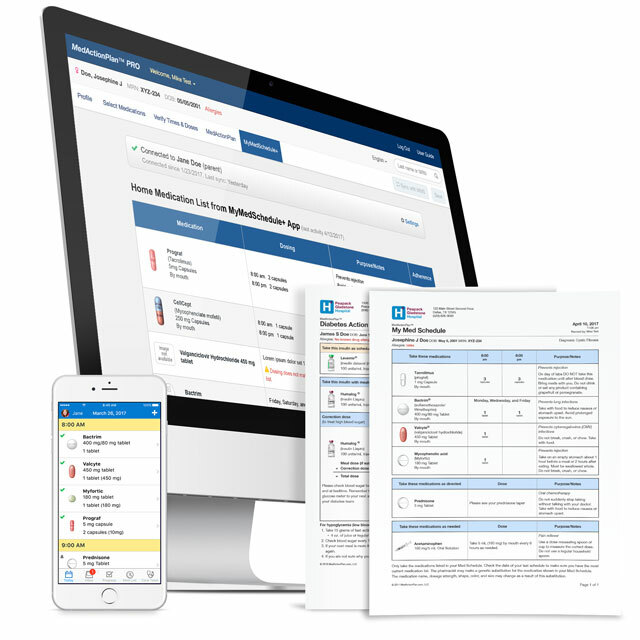 MedActionPlan makes it easy for our patients to visualize and follow their medication regimens. It’s helped improve patient understanding, resulting in better patient safety and medication compliance. MedActionPlan programs have been proven to improve adherence, reduce healthcare costs, and increase patient satisfaction. 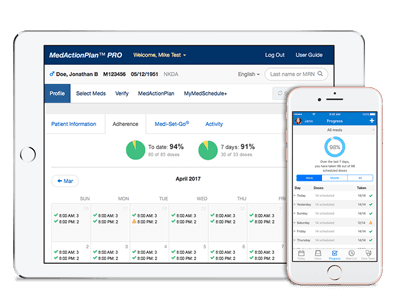 MedActionPlan PRO (Positive Results and Outcomes) builds on that legacy and adds powerful new features. One Platform. Many Great Applications. Our applications are built on the MedActionPlan PRO platform, so a single Business Associate Agreement and security review cover all our applications — and patients benefit from consistent medication schedules and instructions across all of the apps. 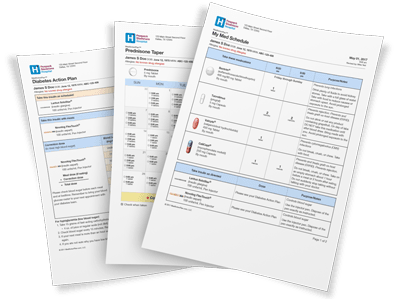 Print or push medication information, instructions, and tasks in simple, easy to understand formats. 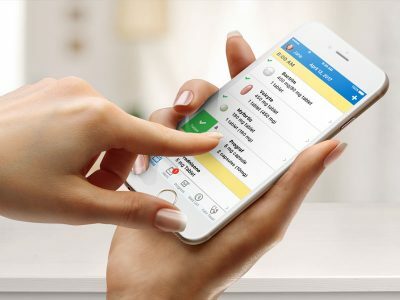 Push complex medication schedules to MyMedSchedule Plus, a free app for patients that reminds them to take their meds, tracks adherence, and shares changes with their care team. Engage patients everywhere with their preferred communication method — MyMedSchedule Plus, text message, or voice. Monitor their progress in an adherence dashboard. Text is written at a 5th grade reading level to simplify complex regimens. Exclusive images help patients recognize their medications. Communicate with non-English speaking patients in their preferred languages and culturally appropriate formats. Provide action plans and other unique solutions for specific patients and conditions. Reach patients through their preferred method of communication — print, mobile, or SMS — and document all in one place. Options for large type and voice messaging are available for patients with poor vision. Schedule doses for specific times, with options for complex non-daily regimens. Keep copy consistent with your organization’s standards. Set defaults for medication images, purposes, and instructions across your whole organization or for specific patient populations. MedActionPlan PRO connects with the EMR to get the current med list, and Single Sign On (SSO) means you don’t have to log in again. Also available as a standalone program. No more long agreement process. Because our apps are built on a single platform, you can access all of our current and future applications with a single business agreement and security review document in place. Add or remove users and assign permissions, from read-only access to full administrator privileges. Logs record user activity in MedActionPlan PRO. Add your organization’s logo and contact information to every MedActionPlan PRO schedule. MedActionPlan PRO follows all HIPAA standards for protected health information. We do not sell lists of customers, users, or others to third parties. AES 256-bit SSL encryption protects data. Logs record activity per user and per patient. Inactive users are automatically logged out. We work with healthcare providers, payers, and drug companies to improve outcomes and decrease healthcare costs.